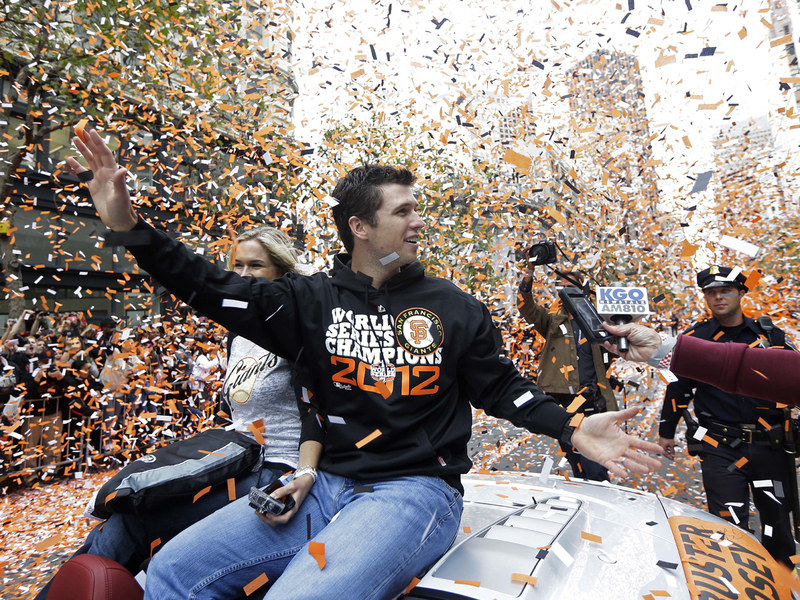 SAN FRANCISCO Orange-and-black clad hordes flooded the streets of San Francisco on Wednesday for a ticker-tape parade celebrating the 2012 World Series champion Giants  a Halloween treat made all the more sweet as a repeat performance. Tens of thousands of people decked out in the team's holiday-appropriate colors stood 20 deep behind barriers along the city's main commercial street to watch their favorite players wave from atop individual convertibles. Standing next to a gold Rolls Royce that served as his ride, Giants manager Bruce Bochy credited the fans with helping lift San Francisco to its second World Series victory in three years, an improbable double play for a team that before 2010 had not won a World Series title since 1954. "The support they gave us was unwavering," Bochy said. "Even when we were six to seven games back, they kept filling the park. They never gave up on us. They are like part of the club." CBSSports.com's Jon Heyman says the Giants' title speaks volumes about Bochy and his legacy. "Bochy's biggest call this month, which was to move two-time Cy Young winner Tim Lincecum to the bullpen, is obviously going to get the most attention. Lincecum was struggling with his confidence (he even pitched out of the stretch with no one on base in the NLCS), yet he became a monster in the 'pen," Heyman writes. "Lincecum didn't complain at all. He just sucked up. And then he did his new job masterfully. That's on Bochy, too. The Giants know not to question him now." As with the 2010 parade, this year's edition drew a cross-section of the region's diversity, from children who were allowed to skip school to older couples who had been Giants fans since the team arrived in San Francisco from New York in 1958. Spectators watched San Francisco 49ers quarterback Alex Smith drive a car carrying Giants pitcher Matt Cain, while 49ers coach Jim Harbaugh did the honors for Giant Brandon Belt. With the victory parade coinciding with Halloween, costumed masses brought an even more festive feel to what city officials stressed will be a family friendly, alcohol-free event. Richmond resident Kevin Yarbrough wore a giant white panda costume in tribute to Giants slugger Pablo Sandoval, whose nickname is the "Panda." Yarbough had gotten up early to put in some time at work before getting to the parade route around 7:30 a.m.
"You've got to come out and celebrate like this. You meet a whole new family, make new friends, and it really lets the community celebrate in a positive way," he said. Vendors got an early start as well, hawking everything from pennants to lawn chairs from makeshift sidewalk stands amid the crush of the morning commute. The convertibles were intended to give fans better views along the parade route that began at the foot of Market Street near San Francisco Bay and covered about 1 1/2 miles to Civic Center Plaza, the scene of a rally. Many camped overnight at the site to ensure a good vantage point, erecting tents and crawling into sleeping bags for a few hours of uncomfortable sleep amid the chill and drizzle of a foggy night. By 9 a.m., bottles of whiskey and wine were being passed around, and the pungent scent of marijuana floated through the air. James Darden, 42, dubbed the tent city "Occupy San Francisco Giants" and said the wait was worth it. "I'm front and center," the Yountville resident said. "There's no other place I'd rather be right now." Alex Warlen and Kelly Simms, both 17, also spent the night in the park. Warlen is a pitcher and Simms a catcher for San Francisco's Mercy High School's softball team, the co-champions of its division. "Buster is the reason I'm a catcher," read a sign Simms was carrying that referred to the Giants' Buster Posey. The high school seniors said Mercy administrators gave students the day off, so they weren't cutting school. "We would have skipped anyway," Simms said. The 2010 World Series victory parade occurred with little incident, and officials said they expected a peaceful encore Wednesday.